Winner of the South Carolina Heritage Tourism Award, the Lowcountry Trail consists of a beautiful boardwalk that crosses the hillside overlooking Mainfield, a restored rice field of the former Brookgreen Plantation. For enslaved Africans on Brookgreen Plantation, this hill was a bridge between the world of daily work and the familiarity of life in the slave village beyond the crest of the hill. The rhythms of life - planting, growing, harvesting, threshing - changed seasonally for everyone on the rice plantation. Archaeological projects have revealed the remains of four structures on the hillside: the site of the overseer's residence at the apex of the hill, and its kitchen, smokehouse and dependency closer to the edge of the rice field. 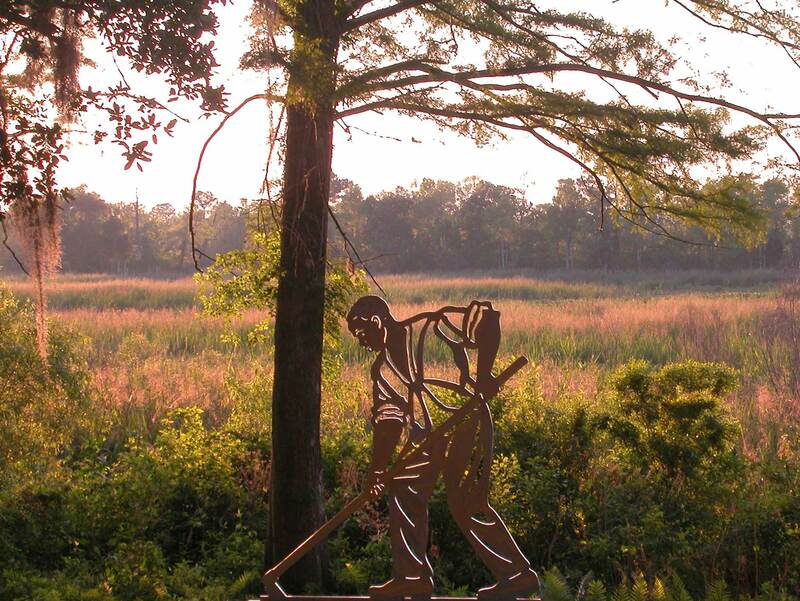 Along the trail, interpretive panels describe life on a rice plantation and four stainless steel figures have been placed to represent the Plantation Owner, the Overseer, and an Enslaved African Male and an Enslaved African Female. These figures, created in stainless steel by Babette Bloch, an award- winning artist known for her site-specific works, serve as visually compelling landmarks to draw visitors along the trail and to interpret a revealing story about each one's role in the economic and social system of a Lowcountry plantation. The Lowcountry Trail Audio Tour is a public education program that emphasizes historic preservation.The tour winds along the Ricefield Overlook and adjacent rice field and is free with garden admission. As you walk the trail, a 30-minute fictional story about life on Brookgreen Plantation unwinds progressively, on listening stations placed along the way.